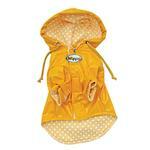 Splish Splash through puddles and don't smell like a wet dog with this fun Polka Dot & Daisies Dog Raincoat by Klippo. Touch fastener strips around sleeves. 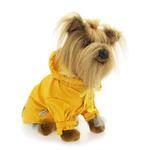 This is a cheery dog rain jacket that will make rainy days brighter and your pup stay drier! 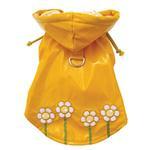 This adorable rubber ducky yellow hooded raincoat features daisies embroidered on the back, and soft cotton lining accented with white polka dots. There is a touch fastener strip around each sleeve to prevent rain from splashing into the sleeves. For ease of walking, there is an attached large D-ring on the back for easy leash attachment. This dog raincoat is easy to put on with touch fastener closure at the chest and a drawstring hood keeps your pup's head dry. The cute polka-dot lining is a nice breathable cotton and provides a comfortable layer of warmth against your pup's body. Don't let the gloomy weather keep you and your pup inside. 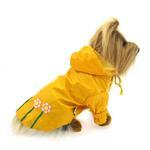 This bright yellow dog rain slicker will have you both singing in the rain! Vinyl shell. 100% cotton knit lining. Machine wash cold with like colors on a gentle cycle. No bleach. Hand dry. Do not iron. Do not dry clean. Polka Dots & Daisies Dog Raincoat by Klippo Customer Photos - Send us your photo! Ruby is a playful and cheeky fur ball. She loves to dress to impress. 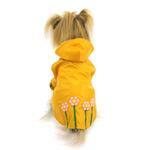 Everyone wants to meet Pixie when she's wearing her Polka Dots & Daisies raincoat. We are finally getting rain in NV. Pixie is prepared in her adorable Polka Dot & Daisies raincoat by Klippo. Zoey does most of her shopping at Baxter Boo. I have been looking for a nice raincoat since early spring. I finally found one on this site. The quality is great. Very soft inside and the outer rubber is also soft making it easy for her to run and walk. Love this little raincoat. Bailey can't wait to wear for a rainy day so she can wear this coat. Out for a rainy morning walk. Posh absolutely loves going outside! So, she really needed this raincoat..and it fits her perfectly! Briley is all ready for April Showers in her new raincoat! in Montana we usually get lots and lots of snow! But this year we have receiving rain. GG loves to go out "Singing in the Rain"
Ivy ready to head out into the rain in her new Polka Dot and Daisies raincoat! We just needed to still put on her matching yellow Guardian Gear boots and she was ready to head out into the wet spring weather! Posted On 08/27/18 by Clinton from Clinton, TN Yes, Clinton recommends this product! Very cute raincoat. Never in a million years did I ever think i'd buy my puppy a rain jacket but when I saw it, I couldn't resist. Love it. Posted On 09/27/17 by Belinda W from , Yes, Belinda W recommends this product! This raincoat fits perfectly! Gracie is ready for the storms! It seems very small but is made really, really well and is so adorable. Returning it to get bigger size. Posted On 09/09/17 by Kris B from Lodi, WI Yes, Kris B recommends this product! This is made well and adorable! Posted On 08/28/17 by Marlene D from Las Vegas, NV Yes, Marlene D recommends this product! Raincoat is so cute. I have to roll up the front legs because I have a shih-tzu. Other than that the coat fits fine. She doesn't like the hood but I just tie it under her chin and she's fine with that. I got her a large and it covers her back. She weights 13 pounds and is almost 17 inches long. Happy with purchase. Posted On 06/23/17 by Vicky H from Columbus, OH Yes, Vicky H recommends this product! Posted On 06/23/17 by Nicole from , NC Yes, Nicole recommends this product! Wow! Had to get a size bigger coz it's an outer wear. Bärra looks so cute in it and might also use this when it snows and sleets this winter. This raincoat is great. My dog will certainly stay dry when it rains. Just need some rain boots to go with it! Posted On 05/19/17 by Debra S from ZACHARY, LA Yes, Debra S recommends this product! It's so cute. Runs a little small. I ordered a small for my 5lb.Yorkie and it is almost too small. Posted On 05/15/17 by Anne B from , CA Yes, Anne B recommends this product! Posted On 05/11/17 by Tresie C from Lake Zurich, IL Yes, Tresie C recommends this product! Love this rain coat! The only problem is, it does not have a slit in the top of the coat for the leash to slip through. Makes it a little more difficult. Posted On 04/18/17 by Chris-Marie I from , Yes, Chris-Marie I recommends this product! This raincoat is adorable. I wish I could have kept it. I ordered it in the extra large since my 21 pound terrier is deep chested. The sizing listed said it should have fit but it was too small. I had to send it back. If you order this, I would suggest getting a size larger. Posted On 01/23/17 by Linda B from Rome, GA Yes, Linda B recommends this product! This little raincoat is as cute as it can be! Sadly, its delivery was delayed several days during which time we had 2 full days of rain! We haven't had a chance to "try it out" yet, but we're looking forward to doing so. I was pleasantly surprised to find that the hood actually has a drawstring; I had envisioned it flopping around while our furbaby pranced around in the rain. This is the 2nd Klippo item I have purchased for our Yorkie and other than having to order up one size, I love their products!!! This is the 2nd Polka Dots & Daisies Raincoat I've purchased for my Yorkies. It's such an adorable coat and we're constantly getting compliments ... so I had to get another coat for my other Yorkie. The raincoat is so cute, easy to get on and off and gives them great coverage when it's raining. And did I mention it's adorable!! Posted On 12/29/16 by RIta I from Chalfont , PA Yes, RIta I recommends this product! Posted On 12/16/16 by Gina E P from bklyn, NY Yes, Gina E P recommends this product! purchased this for a xmas gift for my friend. the designer makes great products but they run very small, needless to say I had to return for bigger size. Posted On 12/05/16 by Cheryl M from , MN Yes, Cheryl M recommends this product! Love this raincoat. Great quality and looks great on my dog. Posted On 11/25/16 by Patricia S from , Yes, Patricia S recommends this product! Posted On 11/10/16 by Nathalie G C from Timmins, Yes, Nathalie G C recommends this product! This little rain coat is as adorable in person as online. True sizing as well. Posted On 10/27/16 by Lynn W from Lincoln City, OR Yes, Lynn W recommends this product! We like this for several reasons -- the snuggly t-shirt fabric lining is great because it keeps the pup a little warmer than just plastic or nylon with no lining ever could. And where we live, the rain is nearly always accompanied by chilly winds, so it's a double plus. It looks cuter in the photo. I do like the feature of Velcro on sleeves to keep rain out. This is a cute raincoat. I just wish it was a little bit longer for my pup - but the chest runs large - but she will grow into it. Highly recommend. Posted On 02/14/16 by Diane from Prior Lake, MN Yes, Diane recommends this product! It's hard to find a nice raincoat. This one is adorable and practical. It's waterproof, gives good coverage,and fits well. It's also great that the leash attaches to the back. Posted On 01/15/16 by Latosha J from North Brunswick, NJ Yes, Latosha J recommends this product! I have a 16 lb Cavalier who is long and lean. I took a chance and got the XL (for the length) and it fit very well. The coat is light weight yet has a warm cotton liner which is great for cold rainy days. The colors are vibrant and ensure that Cami is visible to drivers. The Velcro closures are strong and secure, and stay closed when she squats. If your dog is between sizes, I recommend purchasing the larger size. Lillie & I love our new raincoat!! Posted On 01/14/16 by Myrna K from Boynton Beach, FL Yes, Myrna K recommends this product! I've been looking for a raincoat for my dog and finally found the one at Baxter Boo. She & I love the polka dot & daisy design. This raincoat is easy to put on her and keeps her dry. It looks really cute too. I would definitely recommend this product. Posted On 12/27/15 by Margaret B from Bennettsville, SC Yes, Margaret B recommends this product! Love this cute raincoat! I wish the hood was bigger, but everything else is great. Received item quickly. Posted On 12/16/15 by Rebekah R from new york, NY Yes, Rebekah R recommends this product! super cute - but too big. returned it for hopefully what will be the right size. Waiting to receive the next package! Posted On 12/11/15 by Barbara V from Lakewood Ranch, FL Yes, Barbara V recommends this product! So adorable! My "Daisy" weighs 5 pounds and I got her the small -- it fits perfectly. I am very pleased with this purchase! Posted On 12/09/15 by Paula W from Copiague, NY Yes, Paula W recommends this product! Really cute! Made very well. Good rain coverage! Posted On 11/06/15 by Kim D from Beverly Hills, CA Yes, Kim D recommends this product! This is the cutest jacket--makes me want a girl LOL! I bought this as a gift--it is absolutely adorable. So glad I found/bought it! Posted On 10/30/15 by Linda C from Riverside, RI Yes, Linda C recommends this product! Posted On 04/08/15 by Elizabeth K from Girdwood, AK Yes, Elizabeth K recommends this product! Well-made and cute raincoat...I ordered one that was too small so returned and got larger one. Love the quality! Posted On 02/05/15 by sj from , Yes, sj recommends this product! This raincoat is well made, with quality details. It's also very cute! Posted On 12/14/14 by SuziCat from Knoxville, TN Yes, SuziCat recommends this product! This is made as well as mommys! With a drawstring hood to fit around the face, velcro straps to tighten the sleeves and a nice cotton lining, this bright yellow plastic raincoat is just perfect! The little daisy design is embroidered, not stamped, so it looks really good. The fit is perfect and she looks ready for puddle jumping - I only wish I could find one of these for myself! This raincoat is 2 cute! Posted On 12/01/14 by Debi B from Hammond, LA Yes, Debi B recommends this product! This raincoat is absolutely adorable. I love the daisies on the back. Not only does my girl look beautiful in it but the lining in the inside keeps her dry. Posted On 11/10/13 by Patrice M from Livonia, MI Yes, Patrice M recommends this product! Have ordered this coat twice so far and have not had luck in fitting my dog. She is only 15 pounds so I ordered a Small. It was about big enough for a guinea pig. So I sent it back and ordered a Medium. Still too small in the chest. So I sent it back and I plan on ordering a Large. Hope third time is a charm because this raincoat really is cute. Constructed well with flannel lining to keep the chill off.